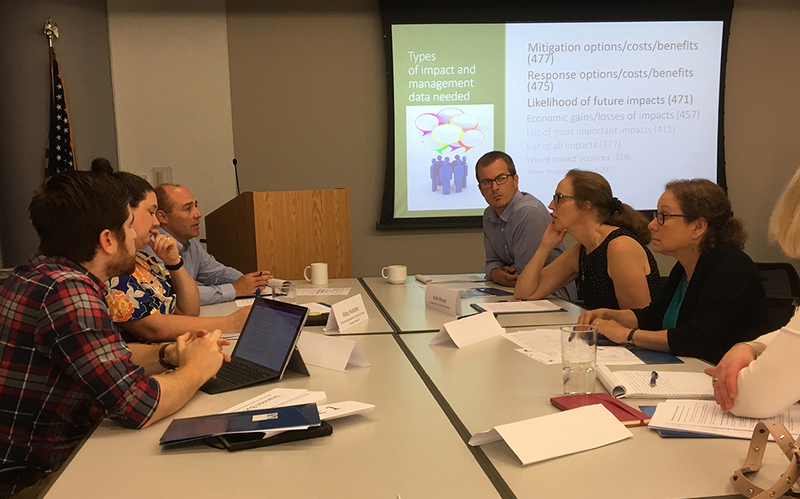 In late July, 30 planners, drought researchers, water management experts, and federal agency representatives gathered for a summit at the American Planning Association’s (APA) Chicago offices to discuss the role of planning in local and regional drought mitigation. The summit, jointly organized by APA’s Hazards Planning Center and the University of Nebraska-Lincoln’s National Drought Mitigation Center (NDMC), is a major step in a two-year FEMA grant-funded initiative intended to study how planners and allied professionals can better understand the influence of drought on other local natural hazards, and the steps that can be taken to mitigate drought’s impacts on people and the built and natural environments. In a series of facilitated large and small group discussions, multi-disciplinary teams of planners and drought experts, led by APA’s Shannon Burke and NDMC’s Mark Svoboda, discussed the science of drought prediction and forecasting, the barriers preventing planners from taking a more active role in planning for drought, and the types of guidance, training, and capacity-building actions that can help to overcome these barriers. Breakout group discusses the role of planning in local and regional drought mitigation. Clockwise: Mark Svoboda (NDMC), Jim Schwab (Jim Schwab Consulting and Chair-Elect of the APA HMDR Division), Nicole LaRosa (FEMA), Troy Brundidge (APA), and Marta Blanco-Castano (Wood). Photo: Kelly Wilson. In these discussions, participants regularly highlighted that drought’s role in contributing to and precipitating other natural hazards (such as flooding, wildfire, and landslides), calls for deeper and more impactful integration of drought mitigation and adaptation in all aspects of local land use planning. However, this requires significant outreach to both experts and drought specialists to better understand the primary gaps in education, training, and access to actionable drought data and information. Participants also got a sneak preview of the results of an APA and NDMC survey sent to APA members to identify their needs and obstacles at the intersection of drought mitigation and planning. With responses from all fifty states, the survey identified critical information and resource needs necessary for planners to address drought comprehensively. Attendees of the drought summit discuss land use planning issues in a breakout group. Pictured, from left: Joe DeAngelis (APA), Abby Hostetler (USDA), Cody Knutson (NDMC), Logan Sand (Colorado Department of Local Affairs), Ruth Rouse (Orange Water and Sewer Authority), Nancy Beller-Simms (NOAA). Photo: Kelly Wilson. The survey report summarizing these findings is now complete and can be found here. 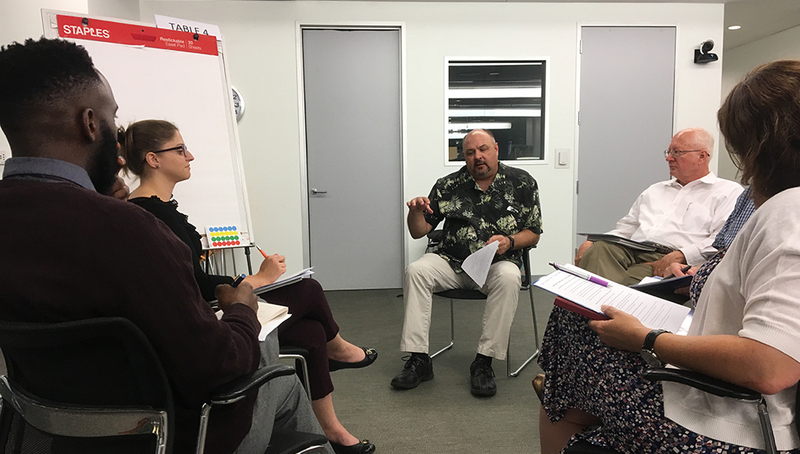 Findings from the summit and the survey will play a significant role in the development of both a planner’s guidebook for drought mitigation, and a series of training and education sessions. The guidebook, a major forthcoming publication jointly developed by APA and NDMC, will provide planners with the tools they need to more deeply integrate drought mitigation and adaptation into their planning efforts and daily implementation work. Similarly, the training and educational events will engage planners in the practice of drought mitigation planning and will be a significant step in bridging both technical and capacity gaps for planners nationwide. This work will also feed into APA’s ongoing water and planning initiative and, in concert with other ongoing initiatives, will help to bolster links between planning practice, land use, and water resources management. APA and NDMC are grateful to the many attendees and the valuable input they provided at the summit. Visit the Drought Mitigation Planning in a Multi-Hazards Context page for more information, resources, and updates. Top image: Folsom Lake, California in November 2015 with record low water levels. Photo by Vince Mig, CC0 Public Domain.